Veronica’s very interesting article in a previous newsletter about Bassets in the media has prompted me to write about our late, dear boy, Sigmund (Verwood Hyper Hyper / Lady Emma of Maghefield). Siggy was a large, handsome, red/white hound with movie-star good looks. Think Brad Pitt with longer ears and better breeding. He was smart and from an early age my wife, Frankie, managed to get him to obey simple vocal and sign commands; sit, stay, down etc. This basic repertoire paid dividends when we were approached by a pet agent who needed a Basset Hound for a photo shoot. We had been kindly recommended to the agent by Veronica. Over the years he had numerous assignments and I cannot remember the details of his very first job. I do know that he was a tremendous success. He was unfazed by the circus that is a photographic studio - the strangers barking orders, the very hot lights and the endless repetitions. In fact, he actually seemed to enjoy the experience, a calm presence at the centre of all the mayhem. His reputation grew with the more work that he did. He began to be asked to attend auditions, a requirement for certain large assignments. Siggy really liked auditions. 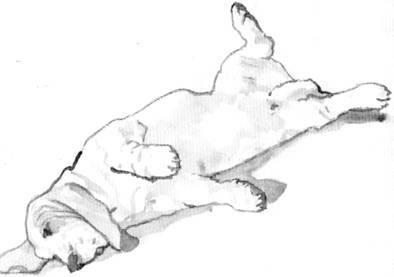 Often, he was up against other hounds who didn’t know the difference between a close-up and a tracking shot. He shone. Some couldn’t even sit and stay and would amble off the set just as the director called, “Action”. Complete amateurs! One could sense him thinking, “Now, this is how you do it!” He would then take the stage and do whatever was required - often first-time perfect. He did jobs for most aspects of the media - newspapers, magazines, and television. The television ads often requiring several days attendance in a studio or, often more fun, on location. Sigmund starred in a television ad for the re-launch of the disinfectant, ‘Domestos’. For this, he was required to sit of the floor of a kitchen, built in a studio. Above him, a pretty model washed dishes at the sink. She looks benignly at two young children pretending to swim across the floor, content in the knowledge that the floor was perfectly clean for this activity, having been disinfected and made totally free of any germs left by this strange dog! Several versions of the ad were shot, as it was intended to be shown in some foreign countries as well as here. To appease various cultural sensibilities the woman’s wedding ring had to be shown on various fingers of her hand. The whole thing took about three days to film. The final shot was of Sigmund, having supposedly been dressed-up by the children, wearing swimming goggles and a pair of flippers. What supreme patience he showed! Interestingly, a couple of years after he had made this ad, Frankie and I were on holiday in Malta. As we walked across the lobby of our hotel we saw a television showing the ad. Many of the people there must have thought us mad as we excitedly yelled, “There’s Siggy! There’s Siggy!” Crazy English - getting excited about disinfectant. Another T.V. ad, this time for Lloyds Bank Home Insurance, required him to be looking sweetly over a garden gate on which was a ‘Beware of the Dog’ sign. This was shot on location in North London. 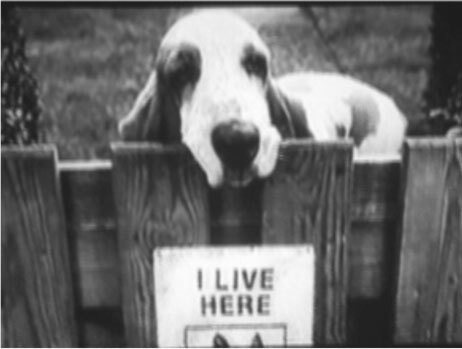 However, when filming started it was soon evident that the gate was too tall and the dog too short for his head to be seen. Quickly, carpenters were called and a platform was built behind the gate and out of view from the camera. Sigmund was then able to assume a position looking over the top as though this was the most natural thing in the world. On completion, he received a round of applause from the film crew and some fine sausages from the catering lorry. One has to be prepared to suffer for one’s art. On one occasion, Sigmund worked with his house brother, Otto. If Siggy was Brad Pitt, then Otto was Joe Pesci. He had attitude. He was a tri-coloured hound; smaller and equally lovable. Frankie could get Otto to do most things with the reward of food. He was such a greedy boy. The job, which I will not identify for reasons later evident, required them to be sitting on the floor at either end of an enormous banqueting table. Beside them, on chairs and also at opposite ends of the table, sat a very elderly actress and actor playing the part of landed gentry. The Lady was to assume a position of shouting something to His Lordship, who was hard of hearing. All this was set against a painted backdrop of a stately home interior. This was the first job that the elderly actress had been offered for some considerable time and she was very nervous. Equally, the actor seemed less alert than probably he had been in his prime. Consequently, the director had considerable difficulty getting a good performance out of either of them. When one was perfect, the other fluffed-up, knocking over a glass or looking away at the wrong time etc. All the time, both Sigmund and Otto were acting impeccably, though getting very hot under all the lights. The director, in desperation about not getting the shot he needed, broke for lunch and the boys could be taken to a nearby park for a run and some fresh air. It was apparent when we returned to the studio that the actor’s lunch had been wholly liquid - and of the single malt variety. His attention span was even shorter than before and the job extended into the late afternoon. Eventually, the frustrated director managed a perfect shot and everyone relaxed. This included Otto, who promptly relieved himself up the oblivious actor’s leg, no doubt a criticism about the old guy’s unprofessional behaviour. Don’t get mad - get even! The director announced, only half-joking, that in future he would only work with dogs. He went on to appear in several ads - some as a solo performer and others as a bit player. He always shone. Later, he become more discerning in the roles that he accepted - he had standards and a career to consider! He was at the top of the short list to appear in Ben Elton’s 2000 film, ‘Maybe Baby’ starring Joely Richardson and Hugh Laurie. Sadly, he lost out only because no exact double could be found to replace him should he get ill in the course of the long filming schedule. 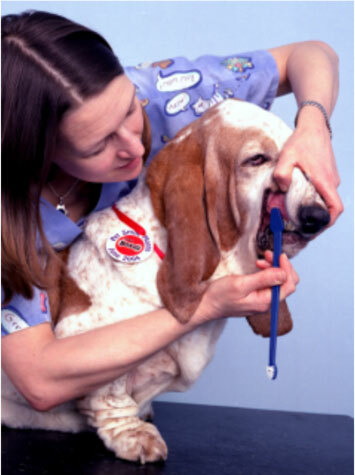 His easy manner and spectacular white teeth got him the job of fronting the Canine Healthy Teeth Campaign. He looked dignified throughout the public humiliation of getting his teeth cleaned. The image appeared on a poster and information packs and was used in veterinary surgeries throughout the country. In time. Sigmund slowly slipped into a well-earned, quiet retirement. The matinee idol good-looks were still there, but now he was very grey. In later years, he could always be seen sporting an expensive, silk, smoking-jacket whilst draped across his favourite chaise-longue. Perhaps, his only regret was that he was never mentioned in the New Year’s honours list. There would be no Sir Sigmund of East Dean. Lesser thesps seemed to get them - Sir Michael Caine, for pity’s sake!Even after his sad demise his contribution to the canine performing arts remains untarnished. I can still hear him say. “Remember, my dear old thing, never ever work with cats or people”. What a hound and such a star - he is still greatly missed.